Truth be told, we conceive and build lots of different things: charts; maps; animations; static graphics; small, lightweight microsites; big, complex websites built on content-management systems; interactive bits that are hard to define that you can click on, activate, filter, and play with. Most projects we work on are actually several of these put together. So, when someone asks us what we do, that’s challenging to answer. Build websites? Well, yeah, kind of. Data visualization? Yes, frequently, but that’s not all. Graphic design? Always at least a little bit, and sometimes that’s the whole project. A great example of this was the Climate Signals website, which we built in partnership with a great climate change and energy communications group called Climate Nexus. The Climate Signals site is a clearinghouse of information about big picture climate phenomena (increased temperatures, changes in rain- and snowfall, etc.,) the specific real-world impacts of those phenomena (individual storms, droughts, etc.) and the science behind the connections we can make between the two. You can see this in action by taking a look at one of the events tracked by Climate Signals – Hurricane Sandy. The first thing you’ll see examining this notorious storm within the Climate Signals site is a page with a thorough set of text and visual content. There’s a description of the event and the best current scientific understanding of its causes, backed by academic citations and references. 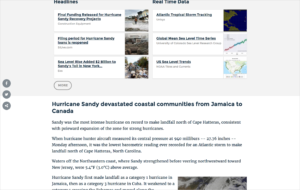 Hurricane Sandy has a life on the site beyond this page, however. 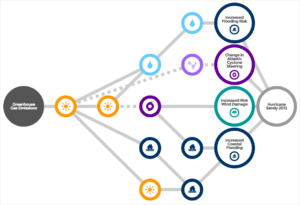 A short distance down Hurricane Sandy’s page, for example, is a diagram showing a complex set of relationships – a chain that connects the warming of our planet due to increased greenhouse gases through its many knock-on impacts to the specific natural effects that contributed to Hurricane Sandy. In the context of diagrams like these, which appear throughout the site and portray numerous events and their causes, Hurricane Sandy is a node in a visual web of cause and effect. Still, Hurricane Sandy isn’t done yet. It also appears on the homepage of the site, as an item on the map of recent and significant past climate events. In this context, it takes the form of a location alongside many others that reveal climate trends at the level of communities, countries, regions, and the world overall. Here we can use Hurricane Sandy’s presence and proximity to other events to understand the variable ways in which climate change is impacting, for example, the United States – hurricanes, flooding, and blizzards in the Northeast; drought and wildfires in the Southwest; etc. Hurricane Sandy and Climate Signals are thus a useful way to understand the larger context of what it is we do here at Graphicacy. Information, whether it’s numeric, narrative, geographic, visual or otherwise, when put on the Web can take numerous forms, often simultaneously. The challenge at hand, working in concert with our clients, is to understand that information and then link it expertly with its best possible displays, from a single embedded chart all the way up to a whole website, and often several things in between. So, that’s what we do – we give life to information in a variety of forms. We strive to ensure that it is engaging, clear, accurate, persuasive, and beautiful, and we use whatever tools and create whatever outputs let us achieve that. That’s why we’ve had the good fortune to get to work on unique, complex projects like Climate Signals … and, why we haven’t quite nailed that elevator pitch.